"Combine meatballs, green peppers, onions, mozzarella cheese, your favorite spaghetti sauce and Sister Schubert's Whole Wheat Dinner Yeast Rolls for a meal your family will devour." Preheat oven to 350 degrees F. Lightly mist a 9 x 13-inch baking dish with non-stick spray. Split rolls in half, horizontally, and place in bottom of prepared pan. Heat olive oil in a saute pan; add peppers and onions and saute until tender, about 5 minutes. Add Italian herbs to vegetables and remove from heat. 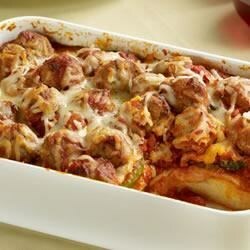 To assemble casserole, layer meatballs and peppers and onions and half cheese over bread. Combine spaghetti sauce and chicken stock and pour over all. Top with remaining cheese and bake 30 to 35 minutes. Serve. Quick, easy, yummy tailgate eats! You must prebake dough!! I used crescents baked forever... Still soggy! My husband & I loved it. I did not have the biscuits, so I substituted noodles. It turned out great. I will make it again.